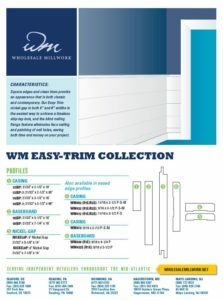 Introducing the WM Easy-Trim and Contemporary Moulding Collections! 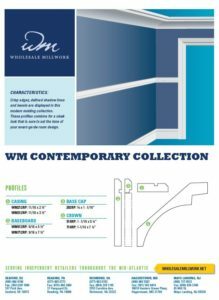 Wholesale Millwork is proud to introduce two new moulding collections to our lineup! Whether you prefer a modern, craftsman, or farmhouse style (or something in-between), our Easy-Trim and Contemporary Collection profiles will provide a clean and simple look that will stand the test of time. 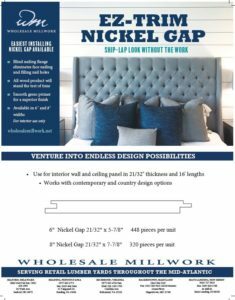 Check out our EZ-Trim Nickel Gap as well, the easiest installing ship-lap product on the market. Ask your sales rep or local office for more details! Do you have a sample box containing these profiles?